Sally Zakariya blew me away this evening. So easy to talk to, we found ourselves on several tangents on topics such as love, career, and each other’s experiences. “A Brief History of Attraction” can be found in Issue 9 of The Apeiron Review. This poem, which reads more like a short poem about life than love, spoke to me on a personal level that I’ve shared with very few. In this poem I found that someone else in the world could have my same feeling and share it at the exact time I needed to hear it. Ms. Zakariya, through our conversation, shared much more with me than I expected and I once again learned more about myself than I ever expected in one (too short) conversation. Zakariya shared a photo of her husband and herself and so there I began my questions. Just from the picture alone, you could tell the two in it were very much in love, and I wanted to know more about each of them. I love the picture you sent me of you and your husband. Could you tell me more about yourselves? Well, we met many years ago after he travelled back to Washington DC. He had been abroad, travelling places such as Morocco and Spain, was learning Arabic and made his living by acting on stages, like music halls and such. He was actually wearing a lavender shirt when we met too (like in her poem). We met in 1972 or 1973 and fell for each other right away. 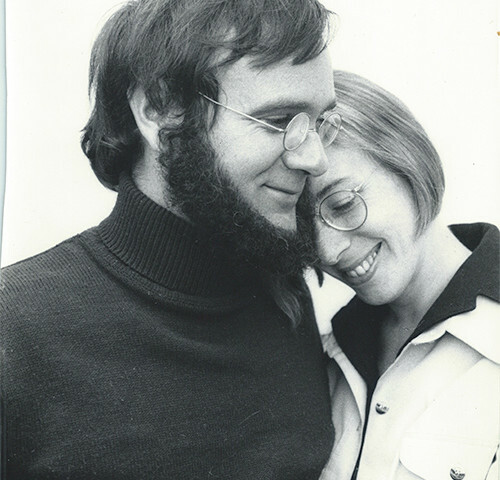 We were married by 1974 and a lot of people said we wouldn’t make it – since I was a graduate from Swarthmore and he a travelling drop out, but we’ve been together for 41 years now. I’m retired from being a professional writer and now I write recreationally all the time. I write about love, death and nature most of all. How would you describe attraction or being love with another person? I write about love all the time. Love evolves all the time, and it usually starts with strong physical attraction but you grow together. It’s almost like being Siamese twins, you are so much part of one another, that I can’t imagine living without him. One part of love, I believe, is creating a family and a place of refuge and comfort. Physical attraction is a given, but tolerance and a sense of humor is what really matters. Being able to laugh about things really makes a difference. So where does the beginning really start according to you? Is there a start or is it circular like your poem? Really I feel like it is like a role of the dice. Zak and I were born a week apart, and I had a friend whose boyfriend knew Zak and we all decided to go out together and it was all just a matter of coincidence. When I met him, I wanted to know more about him. Just like that. Maybe it doesn’t seem like an amazing stroke of luck, but he’s amazing to me on the inside. We didn’t work hard to get together it just happened, like it was preordained. What advice do you have for someone in love or wanting to create a lasting relationship? I grew up having a very clear idea of who I wanted to marry and Zak doesn’t fit into that at all. I wonder if the person I imagined would be any good for me at all now. Again, it’s all about growing together. The right one will come along and things will just fall into place. Finally, how did you get into writing? I didn’t write personal poetry professionally until after I retired. But I believe that the point of writing is to communicate, and a good story is a true story, although I am still self-conscious about putting it out there. I didn’t have much choice, I don’t think, since my father was a librarian and my mother a professional editor. When she died, the very first story I wrote was found in the drawer of her desk. Other than that, I started writing rhymes – which couldn’t really be called poetry – and studied English literature all through school. As we said our goodbyes, and she wished me luck, I found myself happy as I hung up the phone. So much more was discussed between us that I will carry with me forever. Sally had amazing advice and I found myself opening up to her about my own life and relationships and telling her more about myself than I had originally planned (and more than she planned on hearing.) Her patience was astounding. She taught me so much in such a short amount of time; Love will happen when you least expect it, and it will most likely not be with whom you expect; lasting relationships require that you learn tolerance and grow a sense of humor in order to be successful – together. Sally reinforcing something my own heart was telling me was priceless, and I will always cherish the time I spent discussing love with Sally Zakariya from Virginia. Sally Zakariya’s poems have appeared in Broadkill Review, Boston Literary Magazine, Emerge, Third Wednesday, Evening Street Review, Theodate, and Apeiron Review and have won prizes from the Poetry Society of Virginia and the Virginia Writers Club. She has published two chapbooks, Insectomania (2013) and Arithmetic and other verses (2011), and blogs at www.ButDoesItRhyme.com.